Located mainly in an area covered by San’in Kaigan National Park, the San’in Kaigan Geopark stretches from the eastern edge of Kyotango City, Kyoto Prefecture, to the western edge of Tottori City, Tottori Prefecture. Covering an extensive area containing three prefectures, three cities, and three towns, namely Kyoto Prefecture (Kyotango City), Hyogo Prefecture (Toyooka City, Kami Town, and Shin’onsen Town), and Tottori Prefecture (Iwami Town and Tottori City), the San’in Kaigan Geopark boasts numerous scenic spots, historical and cultural sites, delicious foods and beverages, and many other attractions. ◆Click area to jump to detailed pages. To learn more about the San’in Kaigan Geopark, visit the facilities below. 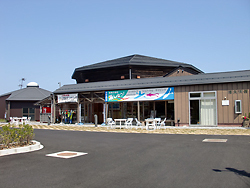 “Tenki Tenki Tango” is a roadside station located on Route 178, close to Nochigahama Beach, where Tateiwa rock is located. The roadside station has a permanent section presenting information on the San’in Kaigan Geopark. It also contains a restaurant, coffee shop, and shop selling souvenirs and produce from the Tango area. There is also a Geopark desk in the station where the staff responds to visitors’ requests. Themed on nakisuna (sounding sand), the Kotohikihama Sounding Sand Museum is a facility that offers opportunities to think and learn about the relations between humans and nature and marine environment conservation. While sand does not make a sound on rainy days, the Museum always provides opportunities to experience how the sand sounds and feels. Another experience that visitors can enjoy only in the Museum is to hear the sound of sand with a unique instrument. The Hall also exhibits tiny seashells and photo panels of seaside plants. 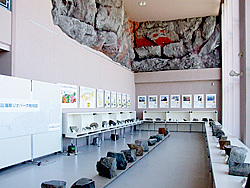 The Genbudo Park Information Center displays exhibits that help visitors see how Genbudo (basalt cave) developed and learn about basalt rocks. An educational device with a touch panel, called “Gen-san’s Lecture on Genbudo,” is available in the Center to help visitors easily understand the formation of columnar basalt joints and other valuable geological phenomena associated with Genbudo Cave. When one touches the LCD panel, commentary is projected on a large screen. Then, the popular mascot Gen-san explains and introduces to visitors the characteristics of Genbudo Cave, its internationally important findings, and the Geopark. Genbudo Cave guides are also stationed at the Information Center, ready to help visitors learn more deeply about Genbudo Cave. (Group visitors are requested to book a guide in advance. 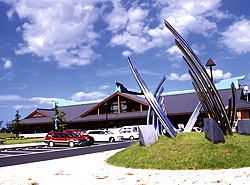 Contact Toyooka City Tourism Association at 0796-22-8112). 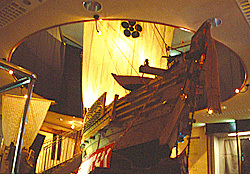 The Kitamae Commercial Ship Museum housed in the Kitamaekan Center exhibits such ship-related articles as a 1/5 scale model of the Tenjinmaru built by local people, ship registration certificates, ship chests, compasses, telescopes, and ship paintings. The Center also contains a restaurant serving fresh seafood and the hot spring “Tanjyo no Yu,” commanding a panoramic view of the Japan Sea. Spreading expansively before the Kitamekan Center are the magnificent views of Takeno Beach and the Nekozaki Peninsula. 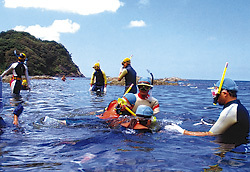 Located in Takeno Marine Park, the Takeno Snorkel Center is Japan’s first snorkel center operated by the Ministry of Environment. The Center introduces visitors to the beautiful natural surroundings of San’in Kaigan National Park and the unique creatures inhabiting it. During the summer, the Snorkel Center attracts many visitors wishing to enjoy fascinating underwater experiences by snorkeling. Roadside Station Kannabe Kogen is the main roadside facility on Route 482, which runs from east to west in the northern part of Hyogo Prefecture. Located in Kannabe Kogen, known as one of the best ski resorts in the Kansai region, visitors can enjoy seasonal landscapes from the roadside station’s viewing lounge. 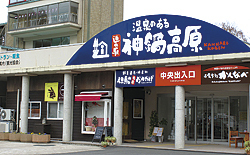 The facility houses “Kannabe,” a restaurant and shop selling the local traditional sweet “Tochimochi,” souvenirs made from local ingredients, and farm fresh vegetables, and a tourist information center equipped with information terminals. An aerial corridor passing through a tranquil forest leads to the adjacent spa “Yutorogi.” Guided tours are also available from here. 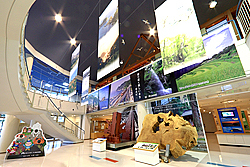 On the first floor, visitors can learn about the San’in Kaigan Geopark. Exhibits concern the Japanese Archipelago, which was formed after being separated from the continent about 20 million years ago, and the climate, lifestyles, foods, etc. nurtured by the geomorphological and geological features of Kami Town. On the second floor, visitors can learn about the “marine culture” of Kasumi, a fishery town that developed and prospered with the sea, including exhibits concerning the history of Kitamae commercial ships, traditional fishing gear, and scenes of crab and squid fishing. Stuffed specimens of fish inhabiting the Japan Sea are also on display on the second floor. 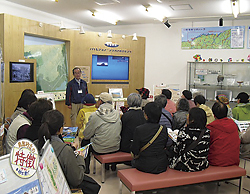 By collecting, storing, and exhibiting reference materials concerning geoparks and providing hands-on learning opportunities, the Shin’onsen-cho San’in Kaigan Geopark Center aims to contribute to the promotion of the local community and the development of education and culture. The Center exhibits models illustrating the strata of the San’in Kaigan, as well as various rocks found at the geosites (geological heritage sites) in the Geopark areas, such as basalt, andesite, and tuff. The Center also provides hands-on learning opportunities to visitors of all ages, from young children to senior citizens, helping them learn about the Geopark from various perspectives. With various materials and images, the San’in Kaigan Geopark Museum of the Earth and Sea introduces visitors to the beauty of the San’in Kaigan Geopark. The hands-on learning section displays exhibits concerning the sand and wildlife of the San’in Kaigan. This section can also be used for various types of learning opportunities. All year round, the Museum organizes outdoor nature observation sessions and lectures concerning nature. Iwami-cho Nagisa Exchange Center provides visitors with opportunities to experience the nature of Uradome Beach. Specifically, visitors can sign up for sea kayaking and snorkeling experiences and are introduced to geo guides for diving and nature path walks. 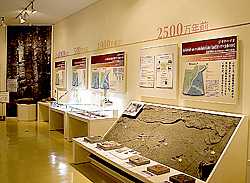 The Center also permanently exhibits photos and rocks of Uradome Beach. In the Gallery Hall, the Center holds such events as pottery exhibitions and concerts. 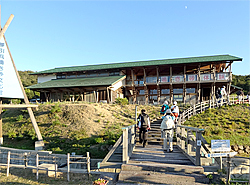 The Tottori Sand Dunes Geopark Center provides in-depth information about sand dunes by such means as the Hi-vision Crystal Diorama, which introduces Tottori Sand Dunes’ nature, geological development, and flora and fauna with high-definition images. There are also panel exhibitions and wind tunnel test equipment for creating wind ripples. Moreover, visitors can join the tour “Geo Story” led by a Tottori Sand Dune geo guide to enjoy the geomorphological and geological features unique to the sand dunes. The Center also offers a twilight tour that is also led by a geo guide and departs at sunset, in which participants can observe sand dune plants and animals while enjoying views of the setting sun and illuminated lamps on fishing boats. 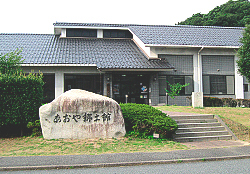 Aoya Community Museum permanently exhibits works of home-grown artists, artists actively working locally, and distinguished artists of Japan. The museum also holds thematic exhibitions concerning the histories and cultures of not only Aoya but also of Japan as a whole and other countries. In the San’in Kaigan Geopark section, exhibits concern must-see spots in the geopark area stretching from Aoya-cho, Tottori Prefecture, to Kyotango City, the beauty of the sounding sand, and the charms of Inshu-washi paper.